A Matter of Perspective | 2P START! Metal Slug games are a lot more hectic than Mario games and the dangers facing the heroes of Metal Slug seem a bit more…dangerous than shimmying Goombas and bouncing koopas. So why is it that the Metal Slug heroes don’t get the big payoff like Mario? Incidentally, I’d love to see the Metal Slug heroes infiltrate the Mushroom Kingdom. I imagine they’d blaze through Super Mario Bros. without breaking a sweat. Also, this is comic #50! Yay! We’re almost at our one year anniversary! Yeah, but if you don’t save her, she won’t be impressed and go out with you! @Ray: Since Brawl is coming out in little over a week in Japan what do you plan on doing spoiler-wise? Are you going to look up all the new characters etc.? Or are you going to wait it out? What I’ll probably do since I don’t want to find out all the new characters before I unlock them(when the game comes out in the US) is have a friend print me out a faq guide with how to unlock all the characters, but with the character names etc. deleted. So it’ll say things like “Beat Classic mode on Hard without using any continues” but without any characters names so I’ll still be like “HOLY CRAP!!!! IS THAT SILHOUETTE (insert char. name here)!! !………IT IS (insert char. name here)!!! YES!!! !”, but I won’t go through things like ’15 minute melee'(or brawl) for nothing. Oh, and if you want a copy when I get it I’ll gladly send it to you. Touche Tim…Touche…..Oh, and my 360 got the Red Ring of Death, so keep yours well ventilated Tim. I’m still debating what I want to do about spoiling myself, and lasting 5+ weeks trying to keep myself in the dark seems pretty impossible…. I’ll let you know what I end up deciding. Did you get this comic idea from playing it recently? I just downloaded it for 360, and first time playing it! It’s an awesome game!! Since there are still at least two world icons for smash bros. that are not revealed (here and here), what other games do you think are going to be included? Hey, guys. What happened to the podcast this week? I thought something tragic happened for a moment (silly me). By the way, nice comic. I like the goombas just lying dead in the background. Sorry about the lack of a podcast this week guys. I was in S.F. for 4 days and wasn’t able to record it on Sunday. We’ll be back next week though! Thanks or missing it! I was worried nobody would notice or care, so it’s nice to know there are those of you willing to say such a thing. Did you guys feel like you HAD to delay this awesome podcast because brawl was delayed? Or because it was martin luther king day? Knowing you guys it was probably NOT the latter. hmm, I’m really not sure what that’s supposed to mean. Anyway, it sort of was because of the holiday since I was out of town all weekend. It’s kind of good to know people enjoy and miss the podcast though, so thanks for the comment. We’ll be back next week with a good one, I promise! Uh, Andrew? Why is there no left indent in your post, while everybody else’s post has one? I don’t see anything wrong with Andrew’s post. But maybe that’s because I went in and fixed it really quick so you’d look crazy, Tristan. Actually, long links or strings of text without a space kind of breaks the comment formatting, so when someone puts something in that’s too long, I usually go in and fix it for them. Thanks for the reminder though, Tristan. For brawl, I would have to unsubscribe from about 25 rss feeds to not have something spill the beans on characters and such. What I want to know is will 2pstart be one of them? Will brawl info show up in the comics and podcasts? Nice comic. As for avoiding spoilers Ray I’d suggest staying off of brawl central or any other brawl related site until you have all the characters, on March 10th. I won’t be doing that because I don’t really mind spoilers. Smash Bros to me isn’t really about unlocking all the characters and being surprised at who is in the game. Its about playing to get better so I can beat people. Speaking of playing smash, we need a rematch sometime Ray. I like comics like these that keep it short and simple, while still providing an effective joke. I enjoyed this comic. I also really like the blurred background look that a lot of the comics have. It really makes the characters and important parts stand out, but its blurred lightly enough to still be able to appreciate the background details. As for Smash spoilers… I’m really not the type that is bothered by spoilers for something like a fighting game, but its understandable for someone to not want to find out all the characters and hidden stuff right away. As for actually avoiding the spoilers… good luck. Although Mario isn’t exactly “ugly” more… Spudly. Because of the awesome spud belly. Pretty funny. 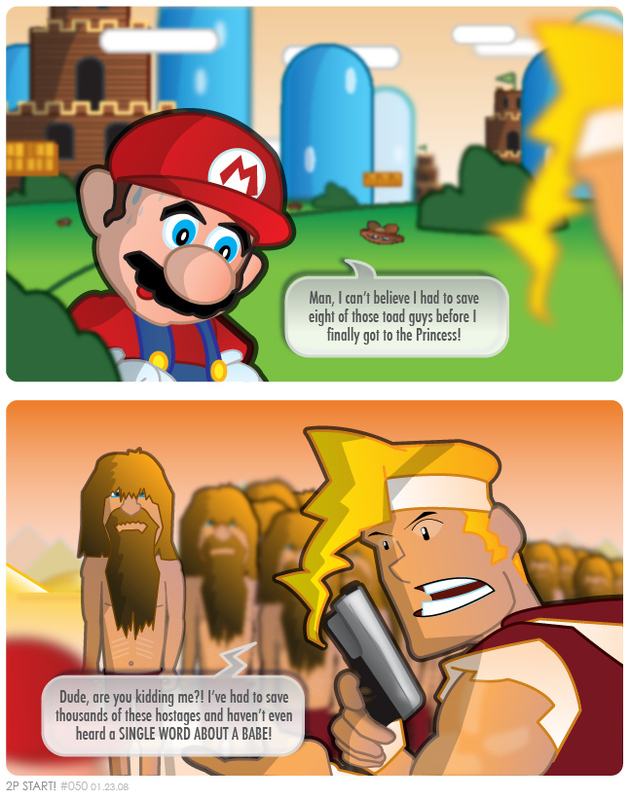 I’d hate to be Mario in that situation. I can’t imagine Mr. Slug over there would be too happy to hear that all Mario has to do is jump around to get a babe while he has to run and gun like a mad man for Yggdrasil knows what reason. Hey, for all you Smash Bros enthusiasts(Ray) who want some more vids check this guys youtube page out . He’s decided to go to some demo kiosk in Japan and record battles for the heck of it. From my understanding he should be posting more videos as time goes on. P.S. There’s rumors of a Brawl demo channel in the works, let’s just hope there’s an actual demo of the game and not vids we’ve all already seen. Okay that time it didn’t work. Maybe if I do this . And Tim, please delete that last post. I never knew that the Mushroom Kingdom bordered the middle east. I’ll have to go visit some time. 🙂 Great comic, by the way. Congratulations on 50! Putting that aside, awesomely clever strip (as always ^^). Keep up the great work. Just started reading your awsome comic and I have to say it’s GREAT to finally see a Metal Slug take. I’ve often wondered… how long have those guys been prisoners? And why do they ALL LOOK IDENTICAL? Super Mario Crossover. Look it up. Sure, it doesn’t have Metal Slug, but Contra’s good enough, right?